Weedon Island and Tampa Bay have a rich history dating back at least 7,000 years; come experience this “place to remember” and see for yourself the past, present and future connections between the area’s culture and environment. 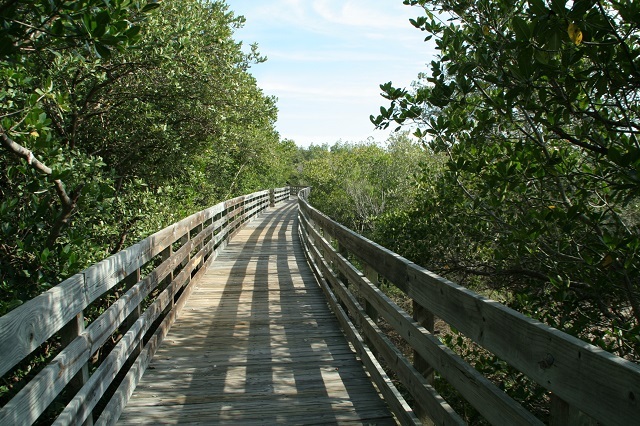 A wheelchair-accessible boardwalk system (connected by a paved interpretive trail) leads away from the main parking area to the mangrove-lined edges and tidal flats of Tampa Bay. Visitors have ample viewing opportunities thanks to a 45-foot observation tower, the Bay and Tower Boardwalks and three observation platforms on the bay and saltwater ponds. Watch for American White Pelican, Northern Shoveler and Hooded Merganser in winter months and waders like Snowy Egret, Tricolored Heron, Black-crowned Night-Heron and Roseate Spoonbill all year. The Lookout Point and Boy Scout Trails meander through scrubby flatwoods and maritime hammocks. Bring your own canoe/kayak (or rent one here) and paddle the site’s two water trails. The on-site, Cultural and Natural History Center offers exhibits pertaining to the ancient Weeden Island people and the preserve’s ecosystems; visitors can take advantage of educational programs, workshops and guided hikes as well. A 200-foot pier, a canoe launch, additional parking and restrooms are located at the end of Weedon Dr. NE.